20.12.2008 - St. Mary’s Church in Harlem, located at 521 West 126th Street, on Sunday, December 14th, 2008 at 3:P.M., will be the site of what is being billed as THE GREAT HARLEM OBAMA DEBATE." St. Mary’s Church in Harlem, located at 521 West 126th Street, on Sunday, December 14th, 2008 at 3:P.M., will be the site of what is being billed as THE GREAT HARLEM OBAMA DEBATE." Dr. James C. McIntosh, Co-Chair, Committee To Eliminate Media Offensive to African People (CEMOTAP), said that, "Although there are strong feelings of support in the community for President Elect Barack Obama, there have also been well publicized expressions of doubt, even among those who have voted for him, regarding his ultimate ability to improve the lives of Black people." At this event a distinguished team of some of the Black Community`s greatest activists and scholars will flesh out both sides of this question. A Panel consisting of Councilman Charles Barron, Dr. Leonard Jeffries, Sister Viola Plummer, Attorney Malik Zulu Shabazz, Dr. Marimba Ani, Brother Glen Ford, Dr. Donald Smith and Dr. James Turner will argue both sides of the issue. The debate will end with commentary from an equally distinguished panel of judges and Elders, Dr. Adelaide Sanford, Pam Africa, Dr. Clinton Crawford, Dhoruba Ben Wahad, Nana Camille Yarbrough, Sister Betty Dopson, and Black Star News editor Milton Allimadi. Organizers say that the role of the elders will be to develop, from the information delivered at the debate, an answer to the question for our community, "What should we do now that America has a Black President?" President elect Barack Obama has indicated that he has an interest in hearing from and participating in discussions that both agree and disagree with his stated policies and point of view. He has been heard to say that he does not want a cabinet of yes men or women, but rather a cabinet that can support its opposition with facts and research. This new and refreshing approach to governance has generated international discussion. 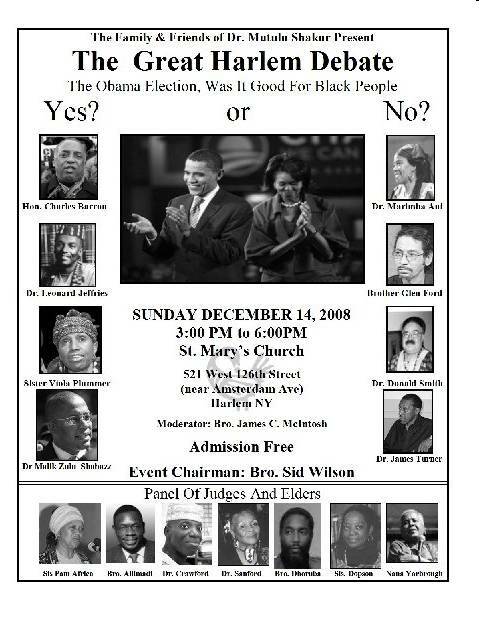 Here in New York, two organizations, The Family and Friends of Mutulu Shakur, and CEMOTAP, The Committee to Eliminate Media Offensive to African People are taking President-elect Obama’s offer at face value and have engaged well known scholars, activists and historians to address the topic "The Obama election: Was it good for Black People, Yes or No? "This event is the first of a series of programs we will be having to develop a unity based on intelligent analysis by the best minds in our community and the will of our people. Whatever one might think about Obama his election could not have occurred without planned, knowledgeable intelligent, unified action on the part of a lot of grassroots Black folks. Obtaining freedom for our Political prisoners and POW`s will take no less," said Dr. James McIntosh. Brother Sid Wilson Chairman of the Family and Friends of Dr. Mtulu Shakur, expressed delight with having such a compelling discussion of differing viewpoints to end up working in unity for the benefit of Dr. Shakur`s protracted fight for freedom.